The Canon Powershot SD790 IS (IXUS 90) (announced March 12, 2008) is a 10 megapixel point and shoot camera featuring a 3x zoom lens (35mm – 105mm) and a 3.0 inch PureColour II LCD display. The Powershot SD790 IS also features face diction, enhanced lens shift optical image stabilization, DIGIC III image processor, and 18 shooting modes. 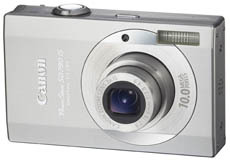 The Canon Powershot has dimension of 91.6 x 56.8 x 20.9mm (excluding protrusions) and weighs 155g. It is expected to hit stores at the end of March with an estimated price of $349.99. LAKE SUCCESS, N.Y., March 12, 2008 – Whether capturing spur-of-the moment inspirations or momentous family occasions, Canon U.S.A.’s newest additions to the PowerShot line-up: SD890 IS, SD790 IS and SD770 IS Digital ELPH cameras continue to provide intelligent, easy-to-use features, resulting in fantastic photos. Integrated Canon technologies such as Motion Detection Technology, Optical Image Stabilization, Genuine Canon Face Detection Technology, and Canon’s proprietary DIGIC III imaging processor, along with the inherent style of the ELPH line; make them the ideal accessory for capturing a night out on the town or an intimate social gathering. "The Canon PowerShot SD890 IS, SD790 IS and SD770 IS Digital ELPH cameras carry on the trend-setting traditions and extend the boundaries of technological ease and the individual sense of style that has always been at the heart of the ELPH line up," states Yuichi Ishizuka, senior vice president and general manager, Consumer Imaging Group, Canon U.S.A. "Canon continues to draw upon its 70 years of imaging excellence and photographic expertise to develop new technological advancements, as well as create stylish form factors as seen in the iconic box and circle design of ELPH cameras." The 10-megapixel PowerShot SD790 IS Digital ELPH camera’s optically image stabilized 3x zoom has a focusing range from a wide-angle equivalent of 35mm to a maximum telephoto equivalent of 105mm. Like the PowerShot SD890 IS Digital ELPH camera, the SD790 IS Digital ELPH camera features the quick and easy-to-use multi-control dial. Though smaller than a deck of playing cards, the PowerShot SD790 IS Digital ELPH camera conveys a cool, substantial look and feel, thanks to its solid, yet streamlined, chiseled design. Adding to its appeal is the camera’s large and highly visible, three-inch PureColor LCD II display, with an adjacent multi-control dial and new button configuration that combine to form a flat control panel. Among the significant technological advances shared on the new PowerShot SD890 IS, SD790 IS and SD770 IS Digital ELPH cameras is Canon’s intelligent anti-blur system. Developed by linking four of Canon’s most cutting-edge achievements: Optical Image Stabilization, Motion Detection technology, Hi-ISO Auto and Noise Reduction technology, the result is consistently sharp and clear pictures, even when the shooting conditions and circumstances may not be ideal. The most common cause of blurry pictures is actual camera shake. This can be caused by anything from a photographer’s unsteady hands to movement in a car along a bumpy road to shots where the zoom lens is extended to a maximum telephoto length or even dimly lit conditions without benefit of flash that causes the shutter to stay open longer in order to admit enough light to make a proper exposure. Canon’s proprietary Optical Image Stabilizer (OIS) physically compensates for camera movement and shake by actually shifting the lens (unlike other Image Stabilization systems that merely mask the undesirable movement electronically). Adding to these ELPH cameras’ anti-blur effectiveness, Canon’s Motion Detection Technology is linked to the camera’s High ISO Auto mode. This improves image clarity by raising ISO speeds (and shutter speeds) for fast-moving subjects (such as a child hitting a baseball from home plate and then running towards first base) or lowering ISO speeds to reduce noise when the subject is stationary. In short, when this impressively intuitive technology detects movement it automatically raises the ISO just enough to reduce image blur. When no movement is detected, it optimally lowers the ISO to reduce noise. All three PowerShot Digital ELPH cameras feature the latest and most advanced generation of Genuine Canon Face Detection Technology, thus ensuring that up-to nine forward-looking faces in the frame – whether posed for a family portrait, candidly capturing friends and fun, or spontaneously snapping a toddler’s expression of triumphant glee as two halting steps – are in focus and properly exposed, with or without flash. In addition to focus and exposure control, the camera’s Face Detection feature captures truer, more accurately lit skin tones (and hence more beautifully rendered pictures) thanks to Canon’s improved Face Detection White Balance. There’s also a new optional "AF Point Zoom" feature that digitally enlarges the face of the main subject on the camera’s LCD screen to make it easy to determine the optimum timing for clicking the shutter to capture the moment. With Canon’s Image Inspection Tool, users can review pictures recently taken on the camera’s bright, brilliant and easy-to-read 230,000-pixel PureColor LCD II display by zooming in to ensure that the subjects are in focus and to check for such picture-damning details as closed eyes or inappropriate expressions. What’s more, with the digital EPH camera line’s Trimming Function, users can easily crop images, centering and creating memorable close-ups whether they are smiling faces or iconic cityscapes. The "brain" in every new Canon digital camera is Canon’s proprietary DIGIC III imaging processor. This exclusive chip is responsible for the camera’s higher performance levels including faster start up, faster autofocus and quicker shutter response times that leave long lag competitors far behind. What’s more, the DIGIC III processor improves both the image quality and the cameras’ power consumption, extending the battery life under typical shooting conditions. The PowerShot SD890 IS, SD790 IS and SD770 IS Digital ELPH cameras are scheduled to be in stores early April, end of March and mid-April respectively. Each of these new, camera kits include a battery pack and charger, a 32MB SD memory card, a USB interface cable, an AV cable, a wrist strap, and Canon’s software suite. Each kit carries an estimated retail price of $399.99,* $349.99* and $299.99* respectively. This entry was posted in Canon and tagged Canon, Canon Powershot on March 13, 2008 by jonathanb. SD790 is a really popluar digital cam right now.